This article first appeared in Unlisted & Unlimited, The Edge Malaysia Weekly, on October 12 - 18, 2015. 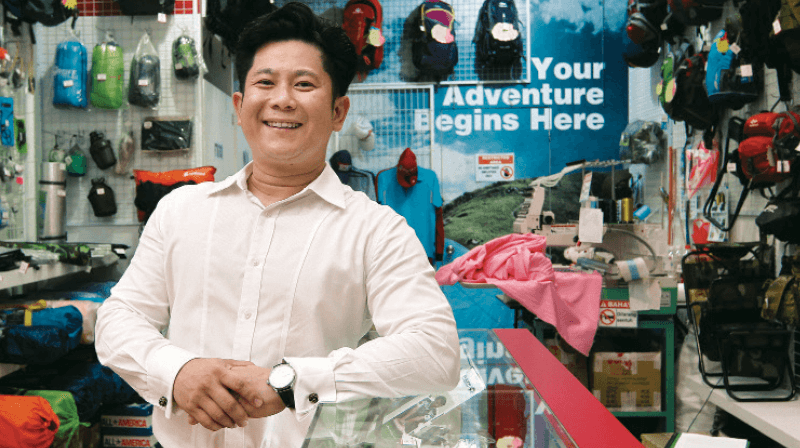 EVEN when he was in his eighties, and long after he had handed over the business to his son, Camps & Apparels Corp Sdn Bhd founder Lai Kam Hong would visit the shop every day. He would observe the goings-on and offer sage advice. This earned him the title of “chairman”, despite no longer playing a formal part in the running of the company. The old man passed away at the ripe old age of 91 in 2005. He did not live long enough to see the company grow into a business with 24 outlets across the nation. But he did impart a lot of wisdom to his son and grandson. In an interview with Unlisted & Unlimited, Camps & Apparels general manager Colin Lye credits his grandfather with the company’s success. He says Lai had successfully passed on his passion to his son and grandson by telling them stories about the early days of the business. Camps & Apparels owns the Outpost Uniform brand, which manufactures and sells uniforms and camping equipment. It was 1961, four years after Malaya had gained independence from its colonial masters, and Lai was a 47-year-old postman with three children to raise. Money was scarce and jobs even more so, but he decided that it was the right time to take the plunge. It was his passion for the Boy Scout movement and his desire to serve the community that gave him the courage to make that leap of faith and start a small shop selling Boy Scout uniforms. “At the time, it was very difficult for people who lived in Klang to buy Scout uniforms because they had to travel all the way to KL to do so. It was a quite an undertaking because transport at the time was very limited,” says Colin. Lai’s passion for the Boy Scout movement stemmed from his own involvement in scouting when he was in school. He was one of the earliest scouts in the country. He loved outdoor activities and valued the friendships he built and community feeling he shared as a scout. That was why he wanted to start the business in Klang itself and serve the local community. This led him to the Baden-Powell House of Kuala Lumpur (Lord Robert Baden-Powell was the founder of the Boy Scout and Girl Guide movements) in Jalan Hang Jebat, about 30 years after he had left school, to buy things like scarves and badges so that he could sell them in Klang. Back home, however, it was Lai’s wife Wong Yoke Moy, who worked tirelessly to tailor the uniforms. She bought material from a local shop and worked on her sewing machine, which had been a wedding gift from her in-laws. “It was a common gift at that time. Money was scarce and you couldn’t afford to buy clothes from stores, so the women were expected to sew to take care of the family,” says Colin. His grandmother worked very hard. Many times, she would work through the night to finish the uniforms. The business would not have taken off without her efforts. But to her, there was nothing heroic about it. She was simply working hard to support her family. It was what people did in those days. “They did not do a market survey or anything like that before starting the business. The scouting community was small back then. Money was scarce and the uniforms were expensive. The money earned from the business was just enough to support the family,” says Colin. To earn a little bit more money, his grandmother came up with the idea of cutting up gunny sacks to make trousers to sell. It was a hand-to-mouth existence. “Ten sen is probably nothing today, but it was of great value at the time. You worked really hard just to earn 10 sen, and this was what my grandparents did,” says Colin. His father, Richard Lye, was also an avid scout when he was in secondary school. He would cycle along the highway and camp by the roadside for weeks. He was skilled enough to stay in the forest for days. After graduating from school, he joined the military service. “Yes, it is not very common for Chinese to join the military service. He joined out of his interest in outdoor activities. He liked roughing it. My father served in the army for 10 years,” says Colin. Richard didn’t join his father’s business after school or even after he completed his military service. Quite simply, the small shop, while profitable, did not have enough money leftover to hire him. This changed in 1997, when a huge business opportunity presented itself. In that year, the Ministry of Education announced that participation in co-curricular activities (which included participation in uniformed bodies) would account for 10% of the marks for acceptance into local tertiary institutions. Also, several new uniformed bodies were established under the various government agencies, such as the Police Cadets, School Youth Cadets and Fire Brigade Cadets, which offered students a greater choice of activities to participate in. Nobody had anticipated such an announcement and there was suddenly a huge demand for uniforms. Ironically, the uniform industry was experiencing a surge in demand when other businesses were languishing because of the Asian financial crisis. Overnight, the uniform went from being optional to being a part of the family’s budget. People started lining up in front of the shop and there was way too much business to handle, so much so that Colin’s grandmother had to recruit 10 housewives to help with the sewing. It was at this point that Richard joined the family business. Apart from his mother, he was his father’s first partner and made his own significant contribution to the company. With his military background, Richard understood the importance of having uniforms sewed to specification. And he knew that all uniforms had their own set of specifications, which had to be strictly adhered to, so that they could be recognised easily and allow the wearers a sense of pride in being part of that particular uniformed body or organisation. “Everything has to be correct; every badge has to be right and worn properly. It has to be polished to a shine. And this is what makes the members proud,” says Colin. But it was easier said than done. The specifications were very detailed, right down to the type of material that could be used, the size of the pockets, the shape of the collar and so on. This also meant more work for the “production team” — the housewives who helped to sew the uniforms. And it came at a high cost. “But my father remained steadfast in his determination to see it through. Standards and quality were the main things he brought to the company. And this was how we earned recognition from several uniformed bodies and organisations, such as St John Ambulance of Malaysia and The Scouts Association of Malaysia. We are also the only uniform retailer to be recognised by the Ministry of Education,” Colin says proudly. 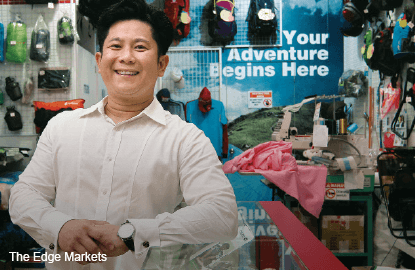 Under Richard, the company took its first steps to differentiate itself from its competitors — the mom-and-pop shops that offered lower quality uniforms at cheaper prices. The business continued to grow and expand. In 2000, the family registered the business under the name Camps & Apparels Corp and opened another shop in Subang Jaya. It is no surprise that Colin also became a scout. But unlike his parents and grandparents, who had a more humble upbringing, he had more opportunities available to him. He studied accounting and finance at the University of Western Australia and worked at an audit firm before joining the family business in 1999. With his education and professional background, Colin was able to modernise and expand the family business when the next wave of opportunity hit. “In 2004, the ministry made it compulsory for secondary school students to join a uniformed body. Again, this fuelled an increase in demand for uniforms and camping equipment among secondary school students across the country,” he says. That was the year the company set up a factory in Kuala Lumpur to increase its production capacity. And more importantly, the company obtained a franchise licence from the Ministry of Domestic Trade, Co-operatives and Consumerism. It was Colin’s idea. The company quickly got down to franchising its business. And by selecting the right franchisees, it has opened an average of two outlets a year since 2004. “We needed to go through franchisees to have a wider reach, to move into other towns. This is because we didn’t have the capacity to manage the business so far away. And there is a lot of engagement to do besides selling products in a shop,” Colin explains. What does this mean? Colin says the company’s business model in the uniform industry is rather unique. Besides having employees at the lower level, the management of the company has to be actively involved at the grassroots level as well. It has to build a bond with the local uniformed bodies and organisations, understand their needs and work together with them. By collaborating with these uniformed bodies and organisations, the company holds training courses for schoolteachers to educate them on the importance of wearing a proper uniform. It also organises activities such as marching competitions, campfires and fundraising events. “Our business is not just about selling products. To get students out of school to participate in these activities, we also have to meet with local education officers to get approval. It requires a lot of interaction,” Colin says. Identifying the right franchisees is currently the most challenging part of the business for Colin. The right person has to be passionate about uniformed bodies and the business. Most importantly, they have to understand the value of service and giving back to the community. “Along the way, we have learnt to see why a particular person is interested in our franchise business. Is it because of profit, or do they see something interesting and good in it? It is more than just attracting retail customers,” he says. Another challenge for the business right now is reaching out to the market and educating people on the importance of proper uniforms. It is hard to estimate just how big the market is, but Colin maintains that there is a large number of potential customers out there. “Currently, there are 4.7 million students in primary and secondary schools. We are only touching the tip of it,” he says. The company has 24 outlets and each outlet services about 15 schools in the surrounding area. Each school has about 800 students, so all this adds up to about 288,000 students, which is slightly more than 6% of the total number of students in Malaysia. There is still a lot of room for the company to grow, Colin points out. Naturally, the company has competitors in the areas it has yet to penetrate. These are mainly mom-and-pop shops that have been servicing these neighbourhoods for many years. Colin says many of these shops use cheaper material and are not bothered about adhering strictly to the uniform specifications. “Our price is about 15% higher, but it still makes a difference if they buy a set of products, from uniforms and badges to other things. However, the quality of our products is better and we adhere to the correct specifications,” he says. Why have none of Outpost’s competitors replicated its business model seeing that it has been so successful? Colin says this goes back to the strong passion and values that he and the company inherited from his grandfather. “I would say that so far, none of our competitors started their business out of their passion of being a part of a uniformed body community. What they see is demand [for uniforms], but we understand the community and are a part of them. We are not just selling products,” he says proudly.